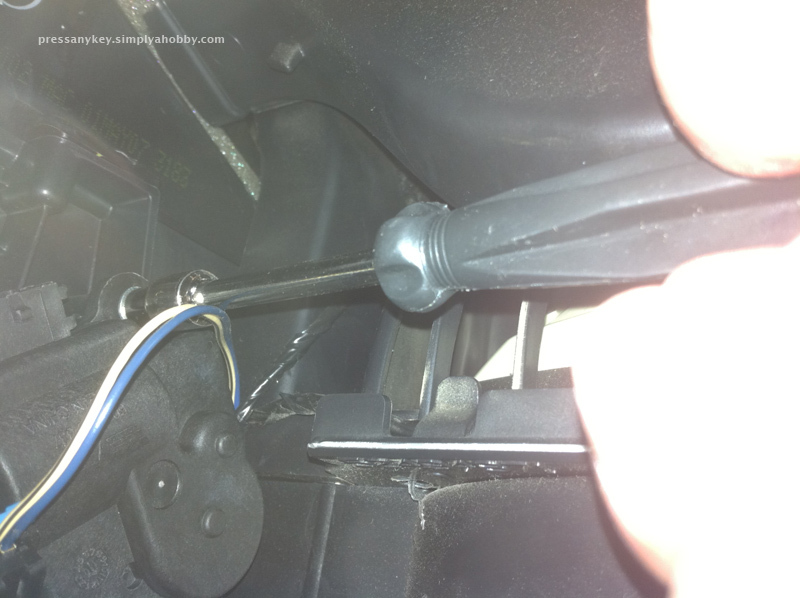 This post was originally added in 2010 but I have since added a couple of notes regarding additional failures, including how I had to handle the failure of another actuator that was located beneath the dash. The first one that failed was ordered from AutoZone but I’ve since ordered several more from Amazon.com listed as a Dorman 604-108 Air Door Actuator. Earlier this week I was planning to watch a football game nearby, after work. I reached my destination, parked, and shut off the car. Suddenly, I started hearing a loud clicking sound on the passenger side of my dash. I restarted the car and fiddled around until I narrowed it down to the vent that draws air into the car from outside. When I set it to recirculate air I heard the vent door shift and stop clicking. As soon as I set it to outside air the clicking started. Shutting the car off didn’t help because it always attempted to revert back to the outside air position. Well, that ruined my plans for watching the game. I couldn’t leave the car because it would keep clicking and could potentially drain my battery or further damage whatever was making the noise. As a results, I drove back home. Of course, when I got home I was able to get it to go into the correct position without clicking. I quickly learned that the most likely cause was a blend motor, which controls the position of the vent door. Based on others’ experiences it was mostly likely a stripped gear. The component would need to be replaced and one poster stated that he paid about $40 for the part. Fortunately, replacing the part isn’t too difficult because it’s accessible from the glove compartment. To get the glove compartment fully open I had to push up on the upper plastic part (part of the dash) so two clips in the back of the compartment door could slip under and allow the door to open completely. The motor that needs replacing is on the far right side. There are at least two (one on the left, which I originally removed but realized it was the wrong one). The one that needs replacing is in a bit of a tight fit. I have a 5mm socket that will fit but I’ll need a very short socket driver to actually remove it. For now, I just unplugged the power connector. If you have this same problem I recommend that you disconnect it when it’s in the position that circulates outdoor air. The reason is that typically the windshield defrosters will only work using outside air. Of course, once you unplug the motor the car will think it’s still working so you probably can defrost without it in the right position. However, I suspect there’s a good reason the defrosters normally work with this configuration. I ended up ordering my part from AutoZone and it was in the neighborhood of $40. It hasn’t arrived at the time of this post so I have yet to actually install it. Update: I successfully installed the new part. It was indeed a tight fit. There’s a wiring harness that runs right in between the access. I was able to un-clip one section of the harness but it didn’t give me much room to move. I didn’t have a short ratchet so I had to borrow one – a standard size ratchet was too long to work in that area. It was very tight and I had to be extremely careful to not drop the screws or socket. Updated 09/08/2011: The other motor on the far left failed a few days ago. The part arrived today. I installed it and took a few photos during the process. Updated 07/06/2014: Another one failed and this time it was one located in the middle of the dash. Rather than make an attempt to reach it, and possibly never be able to put the dash back together properly, I took it to a mechanic. This repair cost me over $300. The part was about $80 plus three hours of labor. The replacement blend door motor. Installation begins with opening the glove compartment. The compartment drops down easily without the need for any tools. It’s just a matter of pressing up on the top in the proper area. It might take a few minutes to figure it out the first time but it does not require a significant force. 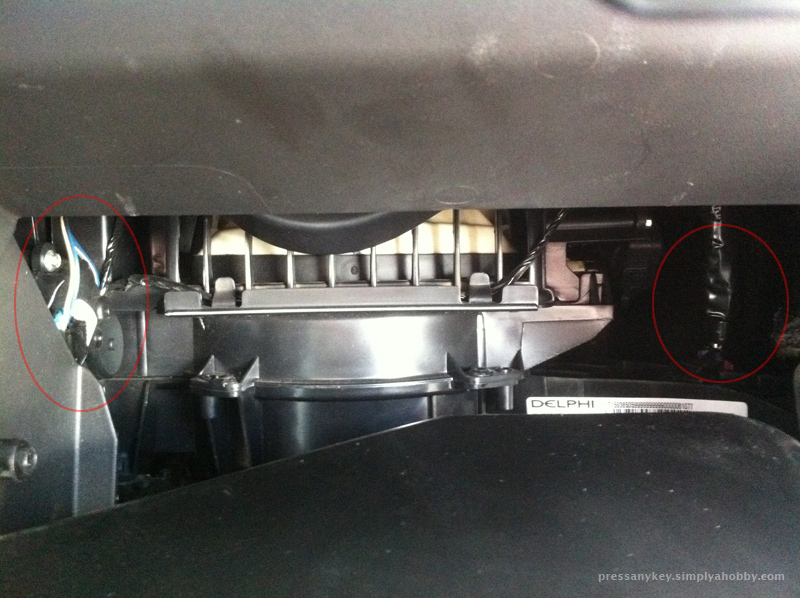 The blend motor I replaced this time is located within the red circle on the left. The first motor that was replaced is located near the circle on the right and is more difficult to replace. 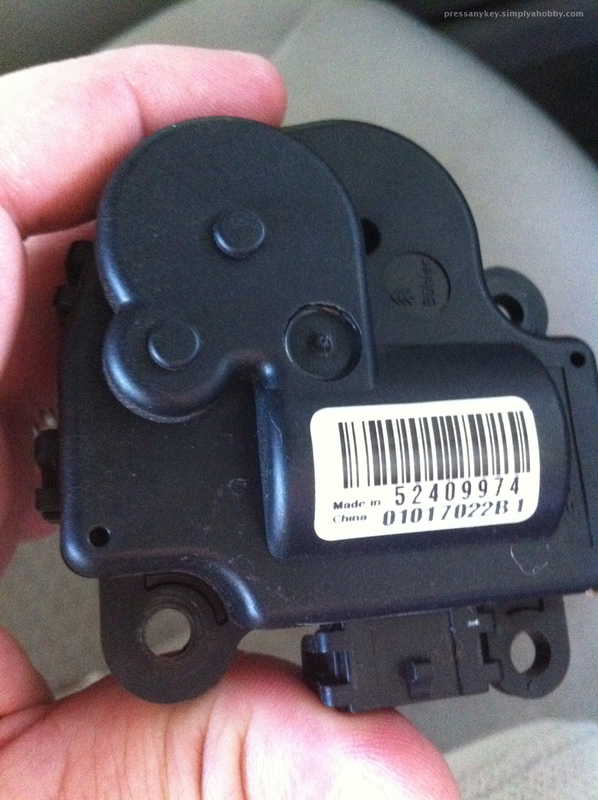 This photo shows the blend motor (identified as the part with the bar code) with its power connector unplugged. Caution should be used when removing the two screws that hold it in place. If they’re dropped I’m not certain how difficult it will be to retrieve them. Removal only requires disconnecting the power connector and two screws. You may need a screwdriver to pop the connector up without damaging the clip. This shot shows removal of the top screw. In this case, this tool worked best, but for the motor on the right a short socket wrench is more suitable. The faulty part removed from the car. There’s a chance it’s not the blower motor but still just the blend door actuators (assuming you have this problem prior to replacing the actuators). It’s possible that when you had the fan turned all the way down that the blend motors were working just enough to return to their resting positions and stop but when you cranked it up the car tried to open the air duct/vent doors but sensed they weren’t in the proper position. I had the impression that the resting position is the same when the car is powered off or the outside vent is being used. If the system senses that the motors closed the doors then it seemed to stop trying (the clicking stopped). However, when mine failed I had to physically disconnect them. Even with the car turned off the system still seemed to think that the bad blend motor hadn’t closed the appropriate vent door and it kept clicking until I disconnected it. At one point I was able to prevent the click by running the A/C and circulating inside air but as soon as I shut the car off it started clicking when it tried to set the door to the vent position (I think). I hope this helps – I may have misunderstood what you’ve posted. I don’t work on my vehicles very often so I’m not an expert but I would suspect there’s another blend motor that may be a problem. I would expect the blower motor to simply shut off but the blend actuators clearly need to reset to a certain position and may keep clicking until they reach that position. I looked through my Haynes manual but couldn’t find a reference to any of the blend motors (including the ones that I’ve replaced). I think I had read about a third motor someone toward the center of the dash in another forum posts, but I’m not certain. It might be a blend door that directs air to the floor. If you haven’t already done so, try adjusting the dial that controls the different blend doors to change the direction of airflow. For example, try setting it to send air to the floor to see if that changes the clicking in any way. About the only advice I can offer is to try to get close to the sound and determine where it is coming from. 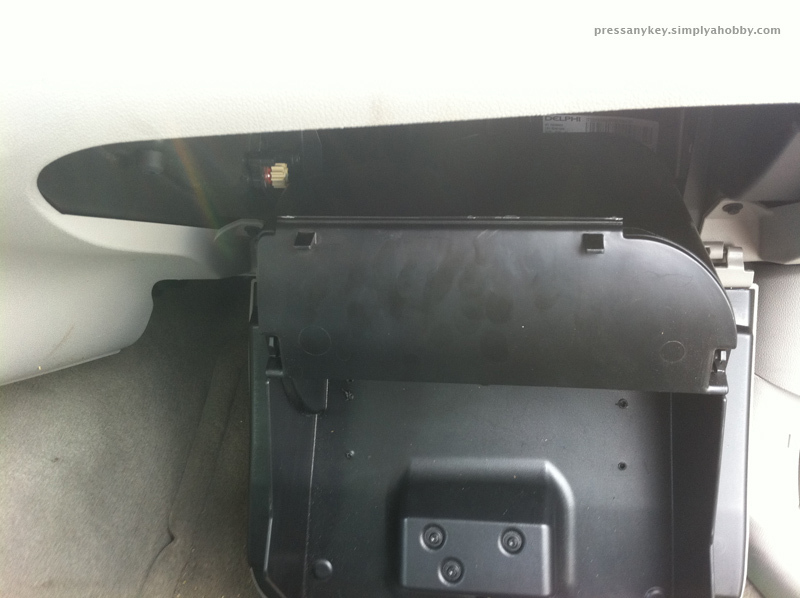 In my car there are two actuators behind the glove compartment so the sound could seem to come from the same place. I’m sorry I don’t have more advice to offer. If the sound really is coming from the same actuator that you replaced then you could check to make sure that it’s properly mounted and lined up. Hopefully the new part that you just installed wasn’t also bad. I have a 2008 Impala & replaced the left actuator behind the glove box not knowing that there was one on the right side also. After replacing the left one, the clicking sound was still there. That is when I found out by a mechanic that there is one on the right side & it is the right side that mostly fails. So I took off the new one I put on the left side & put back the original to the left side & used the new one for the right side & now everything is fine. (want to point out that these actuators can only go on one way. I was finding out that the screw holes were not lining up. So I turned on the car which allowed me to move the door manually & screwed the actuator with the door halfway. It was the only way that the holes for the screws would line up. The door didn’t stay half way. It re-calibrated itself to open & close fully.) So understand, we are not mechanics but we are trying to save a buck. It will take us a little longer than the mechanics but I ended up saving $200.00. So one part can go on either side ??? Yes. That has been my experience with my car. I’ve replaced a couple more since I last updated this post. The reason I decided to YouTube a video to change the actuator behind the glove box was because I paid over $300 To have a dealership replace an actuator that works the passenger side rear door lock. I found that I could actually see the actuator trying to stutter, and also, with my fingers on it, feel the clicking. This prevents changing the wrong one. The Dealer showed me that the damper slot has to be ‘up and down’ or ‘ round side toward the electrical connection. The unit has 7 clips that can pried open with a screwdriver allowing you to rotate the slot in the correct position. This saves about $40, but be sure all of the geer teeth inside are in good shape, or it could happen again. I have a Chevy 2008 Impala that is doing the same thing as mentioned above. I replaced the motor and it started to act up again. I removed the motor again and tried to rotate the arm that the motor attaches to. It was hard to turn without using pliers. Is there a simple way to get at the door to free it up? Also something must trigger the motor to stop and start any ideas on what that is? Excellent post, thanks! You pictures saved me a bunch of effort as another post a different site recommended pulling the glove box hinge pins (unnecessary step). I did find that once you drop the glove box down off the 2 plastic latches, if you remove the 3 screws holding the glove box lock assembly (T15 Torx works there) and the 4 Phillips screws holding the plastic onto the face plate, you will get a bunch of extra arm room to work with. As a clarifying point on diagnosing which actuator is bad, the right actuator controls the fresh air/recirculating blend door, and the left actuator controls the warm/cold blend door for the passenger side. Mine was the fresh air side that failed. also it seems this info is good for a number of newer year models of Impala as after 2007 they were pretty much similar, mine is a 2009 and the instructions were good for that one. Thanks again!! I own (just finished paying off in fact) a 2008 Impala. Do you think you post the part numbers and descriptions for all 3 of the “blend door actuators”? At this point I 2 failure points ….. one on the passenger side and the other dead center of the dash. The one I would like most is the one that found in the center of the dash, the others would be a time saver thought. I own a 2009 impala and I do not have a clicking noise but only have air coming out the vents, no defrost or heat. When I switch between the defrost/floor etc the blower slows down like it should and then speeds up like the motor moved to the right position but the damper did not ANY HELP? I’m not sure. I always discovered the problem when I turned the car off, not before. I have a 2008 Impala. I replaced the passenger left side blend actuator a few months ago(autozone). Today I hear clicking when I shut the car off. I know the sound. But I cant tell which one yet. I need to spend some time under the dash and use the feelers (fingers) to locate the culprit. Hoping its the other side this time. We just had (today) the right passenger door lock actuator replaced. it would not open or close when it was hot outside. On cold/cooler days or in the evening it would lock/unlock easily. I did the back two last summer. So it seems its just that time when age is taking its toll. I wish I was 20 years younger. I was more limber then and had less interference around the mid section. Thanks for all the posts here. It certainly makes it easier to tackle when I read about trick and tips or gotchas. I’m glad that you find the info helpful. Believe it or not this morning I heard one acting up. I’m hoping it was one of the ones accessible via the glove box. I’ve lost count of how many times I’ve replaced two of the three motors. 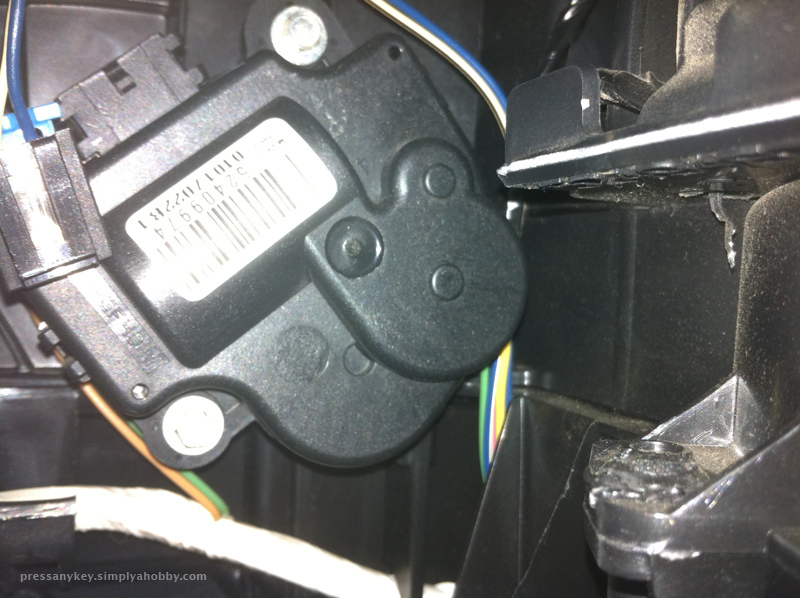 I have had 2 blend door actuators replaced and the a/c control head and the same actuators are make the clicking noise again. Sometimes it starts when I hit the unlock button on my remote & then it will stop about 3 mins after I start the car, it doesn’t matter if the a/c is on fresh air or recirculate and sometimes when I shut it off, it starts doing it again and will stop a few mins after. But one day while I was at work, I went out to the car and had not hit my unlock button and could hear it when I got there, it was clicking and i don’t know how long it was clicking, it wouldn’t stop. It almost ran my battery down. I don’t know what else to do to fix it. Can someone help? I have been able to replace the ones that are behind the glove box but another required taking the dash apart so I paid a place to replace it. I suspect that I have had yet another one fail recently. I am having the exact same problem in my car now. How did you fix this? Thanks! what if the blender motor is left running on and off like it does and you do nothing? My son has left it be for 4 months now. can it cause a short or electrical issue? He has never had a problem with his battery running down from it? and can it cause the whole defrost system to work poorly? All passenger windows rarely are clear, very moist, enough to have to wipe off and stay that way only when cold out, but windshield ok? I’m not sure about a short but it can run down the battery. It just depends on how long it continues doing it after the car has been shut off. 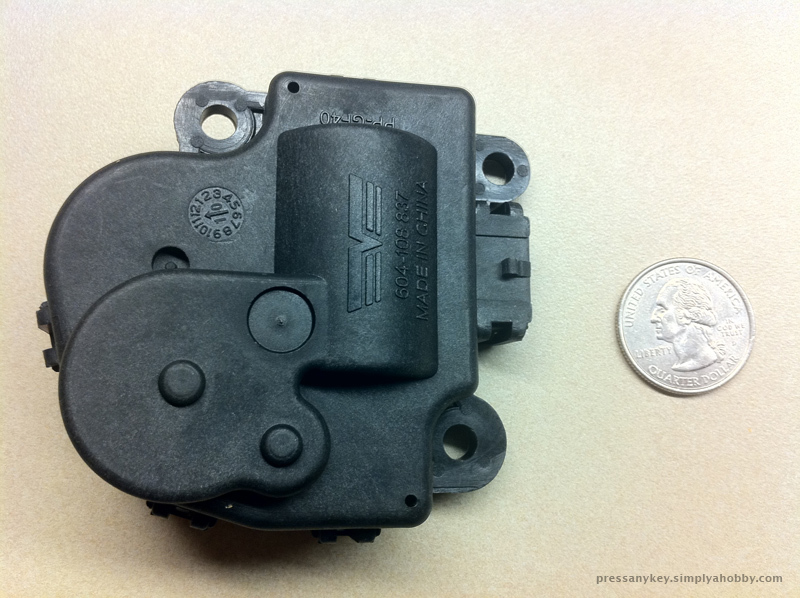 It can impact the front defrost system if it’s the motor that controls airflow for the front defrost/windshield vents. I’m not sure that would have much of an impact on the passenger windows. ; depends on the vehicle. Wow, I’m glad I chanced upon this chat. I have a 2006 Impala experiencing the same problem, has for quite sometime, I’ve just been careful on how and when I move the temperature control dials when I needed to adjust the climate in the car. I took my car in for a repair on another part had them check out the clicking noise and give me an estimate, estimate was $800 which I’ve been told by others is a good price but i didn’t want to spend that much money on both repairs, besides the clicking didn’t affect the actual heating and air, so I passed. I was very pleased with the repair the mechanic made with the original problem but I when I turned on the heat, there wasn’t any…no air conditioning either!!! I called them up told them the problem, said that some how during the inspection of the “clicking noise” they messed up the heating and air conditioning, they claimed they did nothing at all they didn’t even touch it; they just turned the car on, adjusted the temp controls and listened to diagnose the issue. They believe the car lost the function of the heating and air by the little doors getting frozen in certain positions because the car had to sit out in their yard for 3 nights in 30 degree weather. It’s sounds plausible because my car is garaged at night, when it’s at home. Could this be real? Not sure if you can answer this with the little bit of info I gave you but I’ll definitely have my husband read your instructions and look at the pics, he’s pretty good with car stuff, when he has the time. At this point i don’t care if the clicking sound is around I just NEED heat in the car during January in KC! It seems unlikely that the doors would freeze into place unless they were exposed to water, which is also unlikely. I think they either gave you a story or for some reason think this is likely (which I wouldn’t expect a knowledgeable mechanic to suggest). When they fail they can get stuck in a position that would prevent the air from flowing properly. In my experience this usually means that I’m stuck with either hot or cold but not a lack of both. However, when multiple doors fail at the same time odd mixes can occur. I had one fail that controls air to the dash/front window and it resulted in hot air going to the driver’s side of the window and cold air to the passenger’s side. I think that I paid less to have one under the dash repaired; about $300 and most of the cost was simply due to the fact that getting into the dash takes some work. 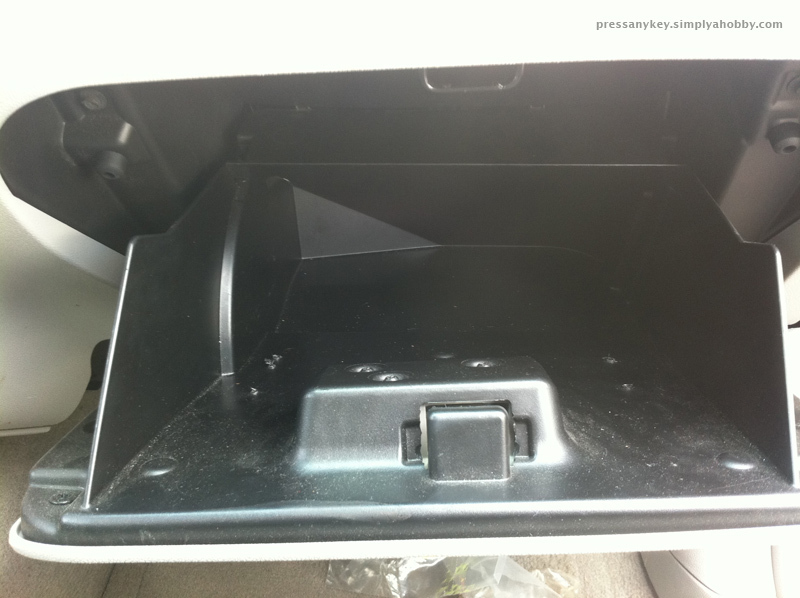 The two behind the glove compartment are “relatively” easy to replace and typically cost me no more than $35/motor. The gears inside the motors are plastic which is why I think they’re prone to frequent failures. The cost of $35/motor was in those cases where I replaced them so I only paid for the parts. Thank you for this wonderful article. After reading it, I was able to go to the Chevrolet dealership and tell them what was wrong with my car and what needed done. The repair charges were $581.75 for “replace out of range air inlet and right side temperature door HVAC actuators and calibrate actuators.” The clicking noises are gone. BUT ever since having the repairs done, I notice the odor of gasoline inside my car while driving. I realize this could be coincidence, but I have never had this problem in the past. The car does not yet have even 50,000 miles on it. Can you think of anything that could have been done during the course of the repairs that could have caused this? I’m not an expert but if they only worked on this problem and didn’t mess with anything else then I’d think it was only a coincidence. If the actuators haven’t been working for a while it’s possible that the problem you just noticed was already there but not obvious since the air wasn’t flowing normally. thanks Michael for this post. I am going to try and replace this myself. Are the 2 autuators under the glove box the same part ? Yes. They are in my car. I hated Pontiac when I realized the pulley belt could not be changed without taking the whole front wheel off !…….I hated Chrysler Intrepid because the battery could only come out from the wheel well !……I got peeved at Ford for using faulty Japanese bearings…..Now I officially HATE Chevrolet (my 2008 Impala) because of the maddening clacking of actuators, or blending doors, SOMEWHERE under the dash…..Two easy ones behind glove box, but nooooo….Somewhere in the middle or left side is the culprit…….So I ask you, why 3 (?) more electrical actuators that cannot be accessed reasonably ? !……..My 1991 Ford Ranger has simple mechanical linkage to control air flow, and I bet depraved, deviant white shirts at Chevy headquarters put a stop to that……….Come on Detroit, I want something reliable, like an AK47, or manual can opener….My homicidal rage can barely be contained…….. The more difficult one on the left is still not all that hard. You only have to take off a small piece of the dash molding at the bottom. The hardest thing is actually getting your body in position (i was upside down) but if you have a well-placed light and patience to fit your body, you can unhook it rather quickly. You can order the piece online for 20 bucks. Thank you so much for this post my impala has been doing this for over a year off and on it actually stopped at one point for about 6 months and has recently started again. it makes the noise when it chooses to. For instance I just came in from a break and its making the noise and my car has been shut off for over and hour. It only does it for about 2 minutes at a time but it is very sporadic about when it chooses to do it. Now that I think I may have a solution after reading this I will be at auto zone this weekend looking for parts. It looks like I’ll be doing the same as well. I had another one go out yesterday. I’ve replaced these so many times that I’ve lost count now. My clicking is effected when I adjust the air and when I use the power unlock buttons. Do I have more than one actuator that has gone bad? My clicking noise is effected, not only by adjusting the air, but also when locking and unlocking the doors. Do I have more than one actuator that has gone bad? There are actuators in the doors. My rear passenger door actuator stopped working and if my memory serves me correctly, it wasn’t cheap to have it fixed. As far as the one behind the glove box, I fix that myself. Don’t get confused! There are 2 actuators behind the glove box. 1 directly behind it and one on the left side of the glove box. Both are difficult to get to, but it can be done, if you want to save money. Unfortunately I don’t know the answer to your question. I have had to replace two more last month, again. Fortunately it was the two that are accessible from the glovebox. It seems to me that all of these actuators are bad.? 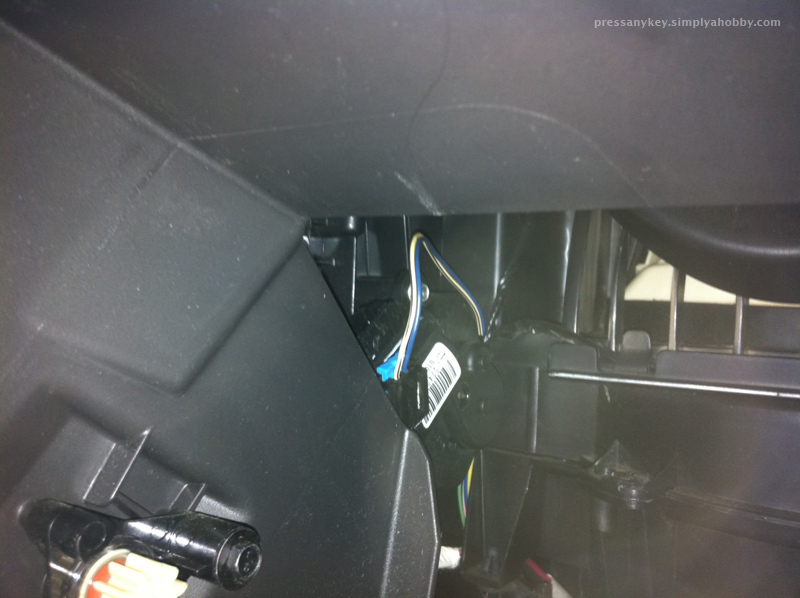 I hear the chatter even when I open the trunk.open and close doors .I would like to know where the do voltage comes from even with the key out of the car? I replaced an actuator in the passenger rear door lock which cost me over $300 at the dealer and one in which I did myself behind the glove box. Other than that, no other actuators have gone bad. But apparently, it appears to be a problem with this year of Impala’s. My question is that all three of the aculator door blend are all the same? I can verify that the two inside the glove box are. I suspect that the one behind the dash is but since I paid a shop replace that one I do not know for certain. I pressed on the top interior and all it accomplished was disconnecting the top plastic from the glovebox. I cant get this dam box to open to the floor.